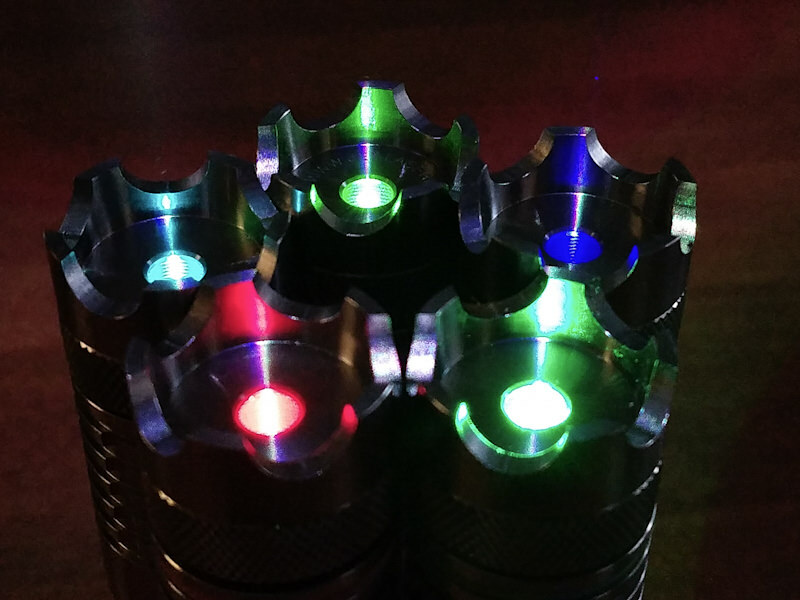 This is the newest addition to my Jetlasers Ti-B collection, it is number six in a (mostly) single mode rainbow, ranging from 405nm to 650nm. whether you call this new wavelength mint green, sea foam, cyan, turquoise, or anything else, it is IMO, one of the most beautiful that I've seen to date! This is a pretty straightforward build, nothing fancy or extraordinary, other than the fact that this is one of my favorite hosts of all time. 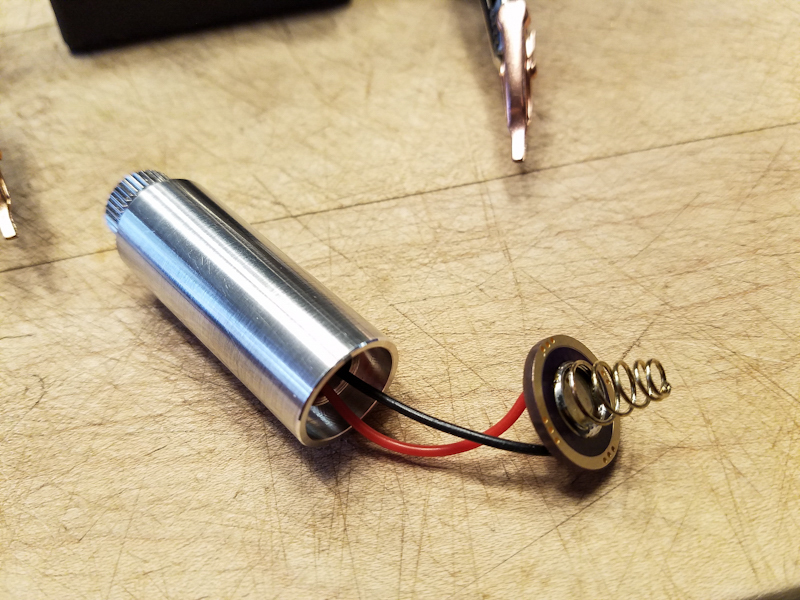 It is built with the Sharp GH04955A2G single mode diode that I was was lucky enough to obtain from Paul (Thank You), and it is using the "Nano" driver, which has pretty much been most common driver for this diode, with mine being set at 275mA. One thing to note, always check your drivers output before using. I had two Nano drivers, one 'low' range, and one 'high' range. I grabbed the anti-static bag marked 275mA and hooked it up to my dummy load, and the output was at 350mA, OH, OH; I then checked my 'high' range Nano driver, and was relieved to find that it was in fact my low range 275mA driver. Just a mix up in packaging, but if I had assumed the one marked 275mA was in fact 275mA, I may have lost my diode! 2 Element '520' Lens 148mW maximum, 138mW average. This really isn't a build tutorial, but I did want to add some photos of a few of the details. I have also included some photos of the J/L Ti-B host, since I find it to be one of the best looking, highest quality commercial laser hosts ever built. 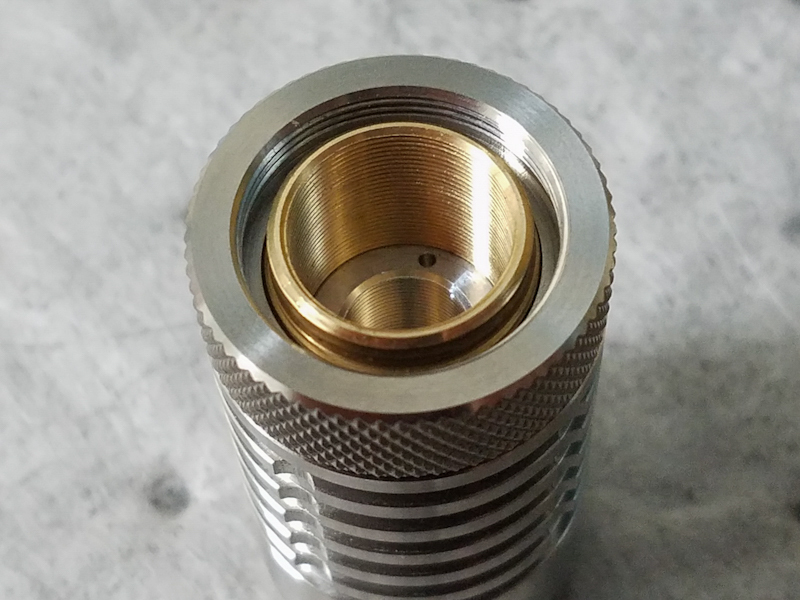 The machining is top notch, inside and out, the square cut tailcap threads are unique in laser hosts, and the rest of the threaded pieces are so smooth that they look to be ground rather than cut. The knurling on the battery tube is impeccably crosshatched, and the turned finish is satin smooth. 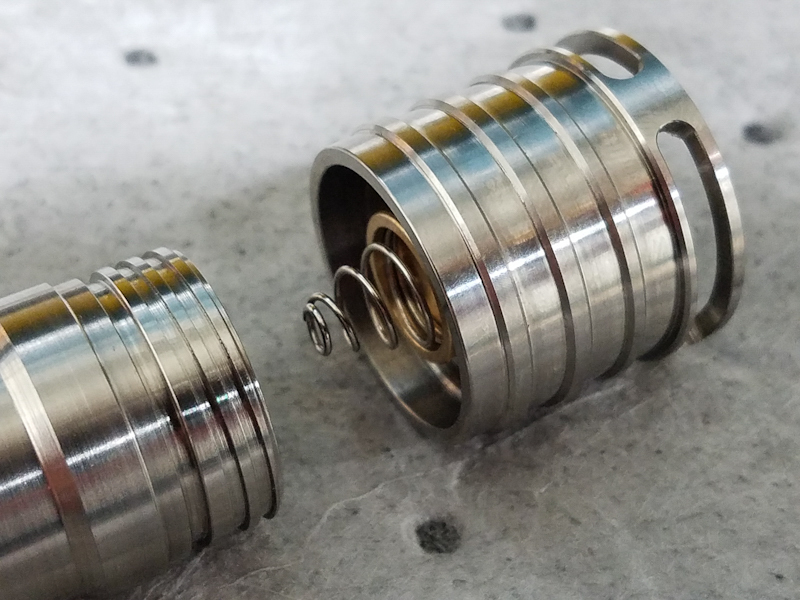 I only make note of these details because while they may not seem too impressive, you need to remember that this host is made of titanium, and not the traditional aluminum or even stainless steel which is easier to work with. Tail cap showing square cut threads. Front of battery tube w/original threaded J/L heatsink and brass diode mount. J/L H.S. and threaded diode holder (everything has been threaded together, no glued components). 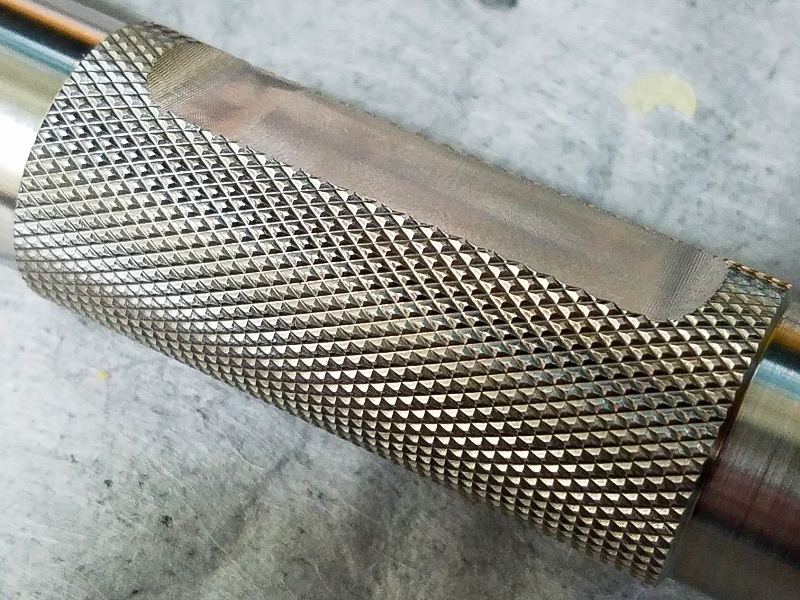 Detail of knurled crosshatch quality. Close up of J/L's unique internal focusing mechanism. New heat sink and battery board/spring. H.S. installed using the modified original J/L H.S. as the retainer. Altered long (14mm) brass lens holder: this allows for use of the J/L integral focus mechanism. Beam in a fully lit room. Notice the perceived color difference, the beam looks more blue than when seen in a darker setting. Beam focused to a point at about 8" from the front of the laser, ....nice waist. I had to put this pic in, just a defocused beam with fog swirling through it, but it looks cool! 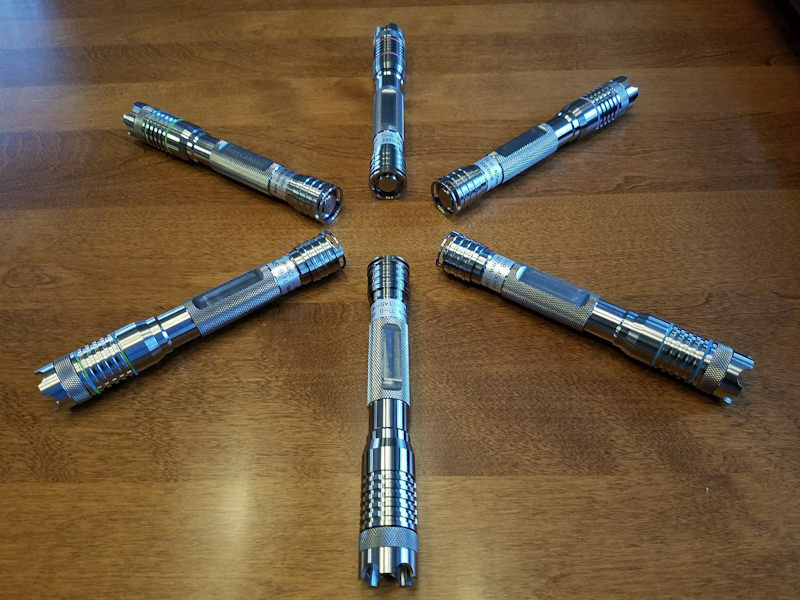 My Jetlasers Ti-B collection ....so far. One of the nicest sets on the planet i'd say! Hows your luck testing the driver first, good call! O and just for curiosities sake, why the 520 2E and not a G2? Oh my gosh what a beauty!!! Your build threads are just pure pleasure to read Bowtie!! -And In case you don't want to keep your 495nm Jetlasers Ti-B, you are always welcome to send it here..
@jnrpop - Thank you also. I went with the 520 lens since it seemed to give me less artifacts around the dot than with the G-2. I also tried the 3 element lens, but I could never get the lenses situated properly in the 14mm long lens holder. I believe that the I.D. of my lens holder is just a bit larger in diameter than the stock 3 element holder. 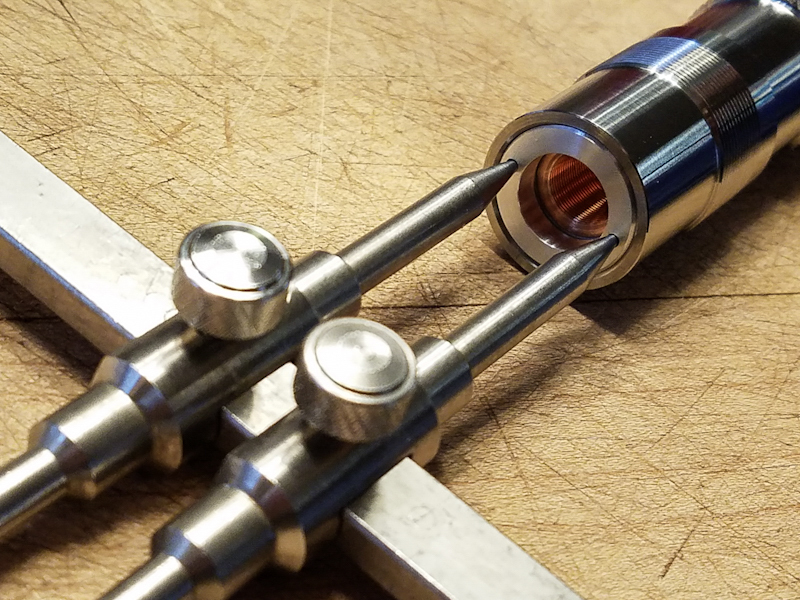 Some of the best shots of the new wavelength diodes I've seen yet! Really excited to get mine in the mail from Paul - especially after seeing this build. Nicely done. I really like the ingenuity with the focusing mechanism. I will have a similar rainbow soon. Except I won't have 520nm. That wavelength is a bit redundant now that I've got a decent 532nm again. Wonderful build and beam shots, BG! A well deserved Thanks and +Rep. You're going to love this wavelength, Curtis! thanks for the kind comments. @brucemir - Glad you like them, I'm hoping for good luck with this laser too; I'd really hate to have it die on me. @RA_pierce - I like their focus mechanisms, J/L does focusing well! I've got the 520nm because it's one of J/L's factory offerings; they offered it for a short time right before they discontinued the Ti-B's.